Venezuelan President Maduro Begins Second Term, As Millions Leave The Country Migrants are fleeing hyperinflation and widespread hunger. More than a dozen governments in the Americas have rejected the legitimacy of Maduro's re-election. 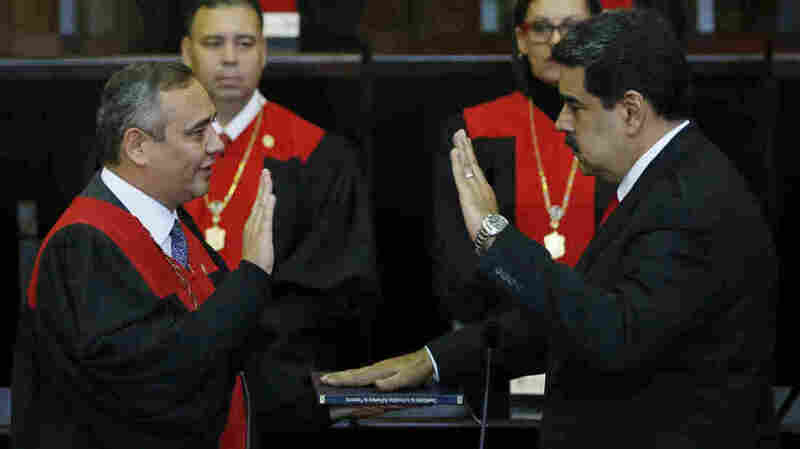 Venezuela's President Nicolas Maduro takes the oath of office in Caracas, Venezuela, on Thursday. Maduro starts his second term amid international denunciation of his victory and a devastating economic crisis. Nicolas Maduro has been sworn in as president of Venezuela, taking power for six more years amid an economic crisis that has caused an outpouring of migrants from the country. The socialist successor to Hugo Chavez won re-election to a second term last May, in a contest that was denounced as a sham by the United States, Canada and a dozen Latin American nations. Maduro was sworn in by the nation's supreme court, The Associated Press reports, cheered on by officials and flag-waving children. Outside the court's chambers, a noticeable increase in security presence marked the quiet streets of Caracas early on morning of the inauguration. By mid-morning, a crowd of supporters lined the street leading up to the site of the inauguration, according to freelance journalist Mariana Zuniga. "Some of [the supporters] were there because they truly supported President Maduro," Zuniga tells NPR's Audie Cornish. But she says others were obliged to attend because they were government employees. "In Venezuela it's not uncommon that state workers are obliged to go to these rallies or vote in elections," she says. In his speech, Maduro emphasized the legitimacy of his government and urged other Latin American countries to acknowledge his second term. Freelance journalist Stefano Pozzebon wrote on Twitter that "massive security measures" had been put in place for the ceremony, following an apparent attempted assassination of Maduro by drones packed with explosives last summer. National Security Adviser John Bolton said on Thursday the United States will not recognize the "illegitimate" inauguration. "We will continue to increase pressure on the corrupt regime, support the democratic National Assembly, and call for democracy and freedom in Venezuela," Bolton tweeted. The Trump administration imposed sanctions on former Venezuelan government officials earlier in the week, citing corruption in Maduro's administration. Last year the U.S. sanctioned Venezuela's gold sector, which Maduro has turned to for revenue as oil production has fallen. Shortly after Maduro took his oath of office, Paraguay's president said the country was breaking off diplomatic relations with Venezuela and refusing to recognize Maduro's re-election. Five Latin American countries and Canada have asked the International Criminal Court to investigate Venezuela for crimes against humanities, including torture and the arbitrary detention of anti-government protesters. Maduro has managed to retain allies in Latin America, despite international outcry. Attendees of the ceremony included two longtime backers of the current Venezuelan administration, Cuban President Miguel Diaz-Canel and Bolivian President Evo Morales. Several Caribbean nations that receive subsidized oil from Venezuela have also continued to support the government, reports NPR's John Otis. Hyperinflation, widespread hunger and deaths from preventable diseases in formerly oil-rich Venezuela have sparked an exodus of more than 3 million people, from a nation with a population of just over 30 million, Otis reports. Most head to Colombia, Ecuador, Peru and Brazil. The tiny twin-island Caribbean nation of Trinidad and Tobago has received 60,000 Venezuelans since the crisis began. But Rodney Charles, a lawmaker in the country, says Trinidad refuses to label them "refugees," in order to toe the line with Maduro's government. "It does not make sense," he told NPR last month. "We hear the news. We hear the reports - the starvation in Venezuela, the incarceration of political opponents." Last year's election drew widespread accusations of fraud. Maduro's government controls most of the country's media and electoral authorities, NPR's Philip Reeves reported. The administration also provided more food handouts in the run-up to the election, leading to a drop in prices, which had swelled due to inflation. A wave of protests driven by the opposition swept the country in 2017, Zuniga says. But after a government crackdown, fewer people have taken to the streets. "Now you can see some kind of protests," she says. "But they are not political or against the government, they are more people complaining about the quality of life, about the scarcity of food, the lack of electricity or water."